Sonic Youth’s Lee Ranaldo has a bunch of live appearances coming up, including three very different shows in NYC and a solo/acoustic tour in Europe. The first one is this Friday (9/5) at St. Ann & The Holo Trinity Church for the fifth annual Dither Extravaganza with electric guitar quartet Dither and a big, impressive lineup that also features a duo set of composer Andrea Parkins with Yeah Yeah Yeahs drummer Brian Chase, noise metal band Cleric, turntablist DJ Rupture percussion trio Tigue, banjoist Brandon Seabrook and still more. Full lineup below. 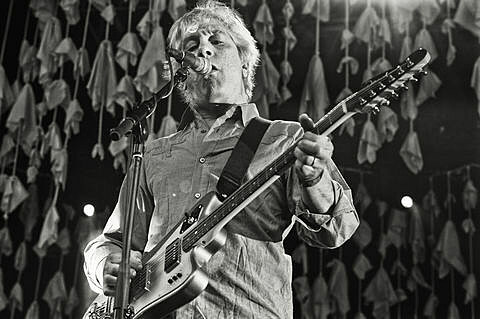 Then on September 27 at Union Pool, Lee Ranaldo and The Dust will play a full-band show, their only one scheduled at the moment. The Dust have a new acoustic LP planned, so maybe we’ll hear some of that at the show. Most details on that LP are still TBA. Tickets for the show are on sale now. Lee also has previously discussed duo set with Noveller at Lincoln Center on November 20. Noveller also opens for Sun Araw at Baby’s tonight (9/4). All of Lee’s various dates are listed below. In related news, back when Sonic Youth were still active they recorded the instrumental song “Creepers & Climbers” for artist Peter Coffin’s Music for Plants project. As the title implies, the music was written specifically to be “heard” by plants, but it was recently made available to humans as well. You can stream it below. In more Sonic Youth news, Art Info points out that Kim Gordon will have a show at Chelsea’s 303 Gallery from June 4 to July 15, 2015. More details TBA. And as previously discussed, Thurston Moore (whose new band also includes Sonic Youth/The Dust drummer Steve Shelley) has a new album and tour on the way. He also has some pretty serious opinions on black metal.